The last time we got American sturgeon caviar from Catalina, it was such a small amount we had to send out for additional “relief” supplies. Finally they arrived and are shown below. The above tin is 2oz (57grams) of American sturgeon caviar from “Fine caviar“. Compared to what I previously got from Catalina Offshore products (0.35oz or 10grams!! ), the price for 2oz tin is nearly identical to the 0.35oz tin and the quality is equally as good (at least to us). Keep in mind the amount is almost 6 times more for about the same price! This is indeed a good size tin for the two of us to enjoy some caviar. 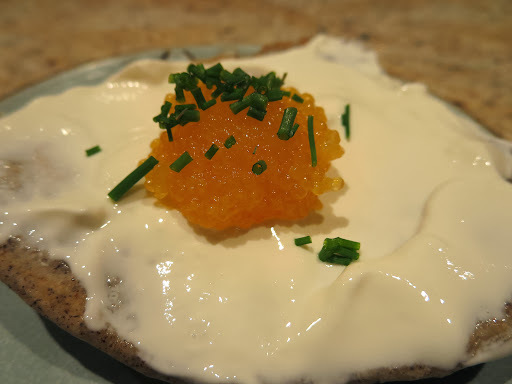 We defrosted several of the blinis we made before and enjoyed the caviar with home-made creme fraiche. Previously we could not get creme fraiche* so we substituted sour cream*. This time we were not going to let a small obstacle such as no creme fraiche at the grocery store stop us. So we made our own(see below). We also added chopped chives as garnish. 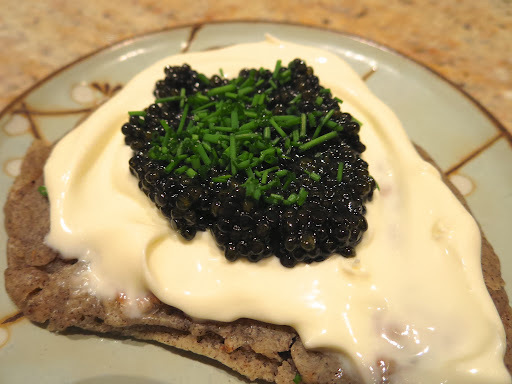 Finally, we could sit down and savor the joy of caviar to its fullest extent—mission accomplished. Since we were ordering the caviar, we also got “Golden Pike” caviar. To be honest, we prefer Japanese “Tobiko” トビコ or “Masago” まさご roe (flying fish and capelin roe, respectively) over this golden pike roe. This roe has a slight slimy texture and not much flavor bedside some fishiness. We also got “Ikura” イクラ (salmon roe) in a small jar from the same source but it looked slightly cloudy. Again we prefer the Japanese-style ikura we get from Catalina or the Japanese grocery store. We like creme fraiche over sour cream (both are commercial products) because the creme fraiche has a more delicate taste and better texture. We thought creme fraiche and sour cream both were heavy cream with lactobacillus fermentation and did not know the difference. It appears that commercially-made sour cream may not be “fermented” at all but made with the addition of thickening agents and acids to heavy cream. We also learned that when adding to a sauce, sour cream breaks easily but creme fraiche does not. We have yet to test this statement in practice. In any case, we knew it was supposedly easy to make creme fraiche at home and discovered that it was indeed easy. We added buttermilk (2 tbs) to cream (1 cup) and let it sit on the counter at room temperature for 1-2 days in a loosely covered sealable container (the time will depend on the temperature—it was fairly cold when we made it). After the desired thickness was reached, mix well, seal the container and refrigerate. That is it. We tried it with “light” (fat 18-30%) cream as well as “Heavy whipping” (fat 36%) cream. Both worked well but we probably liked the one made with light cream because it had a lighter taste and mouth feel. Instead of buttermilk, we could have used yogurt. But we have not tried that method yet. Our homemade creme fraiche is very good–better than the creme fraiche or sour cream we bought at the store. Come to think of it after this we won’t be buying any more at the store.